Homecoming not your thing? There are still plenty of reasons to see what’s going on in Boston and on campus this long weekend. So instead of Instagramming photos of you and your friends in Tufts apparel, you can definitely get a cool snapshot of a new exhibit or watch a film you’d never see otherwise — that’s way cooler to talk about on Monday anyway. Inspired by Danny Hillis’ work “The Long Clock Now,” a clock that runs for 10,000 years, the exhibition sounds just as wild as one would expect from Le Laboratorie. Five-second clips of people running, jogging or walking are stretched out to 10 minutes. In the background, the music of Brian Eno, consisting of bell sounds from “Clock of the Long Now,” plays. The show’s meditation on time and how humans interact with it is sure to be a dynamic and, as always, multi-sensory experience. Tufts University Social Collective has kicked off its October agenda with the horror movie of the year, “Get Out” (2017). The Daily gave it a 5/5, so be sure not to miss it! The Institute is back with its first show of the semester, featuring live and video sketches! They will also be accepting donations for hurricane relief at the show. Interested in seeing some live music over Homecoming weekend? Be sure to check out The Beelzebubs, the Jackson Jills and the Amalgamates as they serenade us all. Tickets cost $5 for Tufts students and are available online at Tufts Tickets, at the Info Booth in the Campus Center and at the door. The Center for South Asian and Indian Ocean Studies is hosting a special screening of Iffat Fatima’s “Khoon Di Baarav” (“Blood Leaves Its Trail”) (2012) in honor of its upcoming conference on Kashmir. The film shines a spotlight on the thousands of enforced disappearances that have been occurring in the region since the 1980s after the push for self-rule began. It follows the lives of the family members of the men who have gone missing, putting a spotlight on those who have had to bear witness to such tragedy. What’s more terrifying than trying to go to the bathroom at a darty? Probably watching Alfred Hitchcock’s “Psycho” (1960), along with two other horror films directed by Richard Franklin and Anthony Perkins, respectively. You never know what’s behind that shower curtain. Sweat off the effects of homecoming with Spirit of Color’s own Dan Camilletti (LA ’17) at Jackson Gym. You’ll be feeling better about that blue zone in no time. Want to know more about artist Dana Schutz, now controversial because of her “Open Casket” (2016) painting? Fellow artist Josephine Halvorson will be leading a tour, particularly discussing Schutz’s work “Big Wave” (2016). There’s no insight into a work of art like that of another artist. 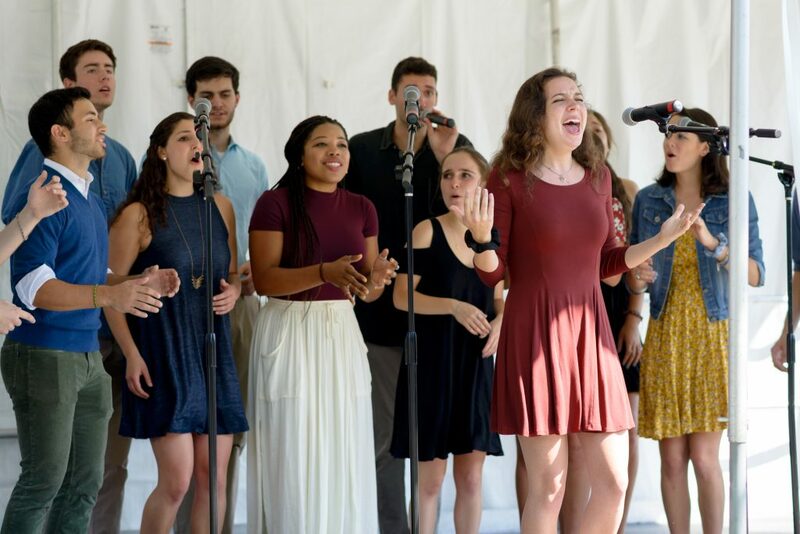 CORRECTION: An earlier version of this article incorrectly listed the dates for the Homecoming A Capella Show, The Institute’s sketch comedy show and the Somerville Theatre’s “Triple Feature.” The article has been updated to reflect these changes. The Daily regrets these errors.